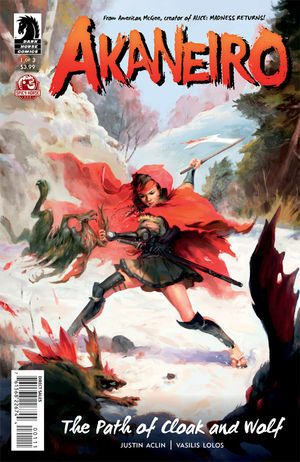 Fairy tales, Japanese folklore, and badass female warriors; does it get any better? Nope! From American McGee, who brought you Alice, comes another stunning re-envisioning. This time, Little Red Riding Hood isn’t so little, and the big bad wolf should be the one who’s scared! With tons of action and stunning art, this new series will be all the better to please you with, my dears! This gripping fairy tale is written by Justin Aclin. The fate of the world she knows rests in young Kani’s hands as she departs on a journey to help save it and the peace of her village. I honestly don’t want to say more than that; this story had me locked in with just the first page! Let’s just say there are some badass female warriors – the Akane – and they keep the land safe by killing the Yokai Demons that cross over into their world. When one of the Yokai causes a disturbance in the peace of the land, young Kani departs on a journey to help restore it. The writing is elegant and flows so well that the end will hit you before you even know you read the whole thing. Could I give any more props to Dark Horse Comics for this masterpiece?! The art by Vasilis Lolos got me too. I had never seen his art until reading this, but he makes every detail stand out beautifully. The detail in Kani’s eyes is gorgeous, and I don’t use that word to describe things much. Both writer and artist work together seamlessly to create this story, and I can’t wait to see more! Suffice to say, I loved it. Akaneiro #1 is out now! Go, go, go get it!